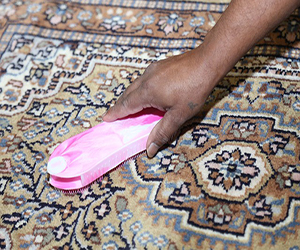 Are you having a hard time removing stains from your Oriental rug? Colorado Springs rug cleaning experts with tried and tested techniques may be just what you need. From Oriental to area rugs that liven up your spaces, Colorado’s Carpet Care Craftsman are experts in keeping any type of rug clean. Save time with the assistance of a professional and have your rug cleaned today. If household cleaners cannot remove difficult stains, you can have your rug cleaned at our facility. As Colorado’s professional rug cleaners, our Colorado Springs rug cleaning experts can identify which type of stain can or cannot be removed in order to have control over the staining. With specialized equipment designed for all types of rug, Colorado Springs rug cleaning experts keep your rug clean and protected. If your rug has a fairly strong smell, professional technicians can assist you. Lack of proper cleaning practices may cause dirt or residue buildup. This can be the cause of the stubborn odor in your Oriental rug. When you hire our Colorado Springs’ rug cleaning experts to have your rug cleaned, odor problems will be the last thing to worry about. If you notice mold growing due to water residue, hire professional technicians to make your area or Oriental rug clean again. Your Oriental rug could be recovering from water damage. Colorado’s professional rug cleaners will inspect it for water contamination and provide the appropriate solution. If you spot discoloration, an expert is necessary. Color can become a big issue when it bleeds. This causes a problem in an Oriental rug’s structural integrity and may warrant repairs. Our color restoration is a highly specialized service from the best Colorado Springs’ rug cleaning technicians. To know for sure, contact Colorado’s best rug cleaning experts. Professionals can help keep your lifestyle healthy. Your time and energy are precious to us, but more so is your family’s health. A dirt-ridden Oriental rug may be a problem for kids at home who love rolling around the floor. With the help of Colorado’s experts in carpet cleaning, you can enjoy a home free of health hazards for you and your loved ones. Professionals can help you save money. Before replacing your “old” Oriental rug with a new one, let Colorado Springs’ rug cleaning experts guide you. We can let you know whether or not you should have your rug cleaned or salvaged before replacing it. Professionals can offer a warranty. When you hire professional Colorado Springs’ rug cleaning technicians from Colorado’s Carpet Care Craftsman, you are given a 30-day warranty. Colorado Springs rug cleaning experts will refund your money within the specified period should you have problems. Professionals can deliver results while educating you on proper maintenance. Colorado’s expert rug cleaning technicians do not overpromise. Instead, Colorado Springs rug cleaning experts get the job done while recommending the best practices to keep your Oriental rug clean. Learn about some of the benefits of rug cleaning here. With several decades of experience in Colorado’s carpet cleaning industry and more than four million square feet of carpets cleaned, we are recognized as experts among Colorado’s rug cleaners. Colorado Springs’ residents trust only the best in keeping their rug clean and so you should you. For your Colorado Springs rug cleaning needs, hire Colorado’s go-to rug cleaners. Colorado Springs’ Carpet Care Craftsman guarantees high-quality service that can lift the burden of cleaning rugs in Colorado Springs. Invest in Colorado’s best rug cleaning services, and have the Colorado Springs rug cleaning technicians help keep your rug clean. Click here to learn about our residential cleaning services and why we provide the best rug cleaning Colorado Springs.